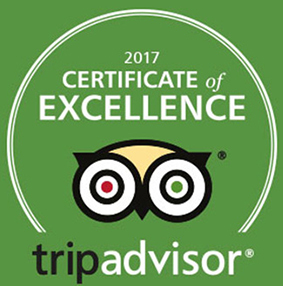 / Best Award Winning BBQ Destin FL / Let’s Roll CRIMSON TIDE vs #12 SOONERS|Auburn|LSU & MORE College Hoops, Pizza, Wings & FULL BAR! 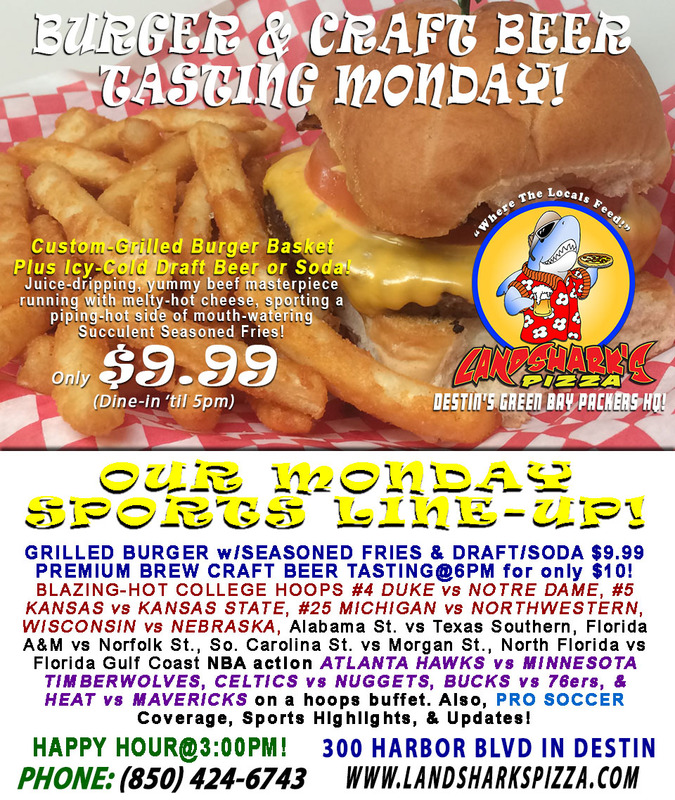 Let’s Roll CRIMSON TIDE vs #12 SOONERS|Auburn|LSU & MORE College Hoops, Pizza, Wings & FULL BAR! 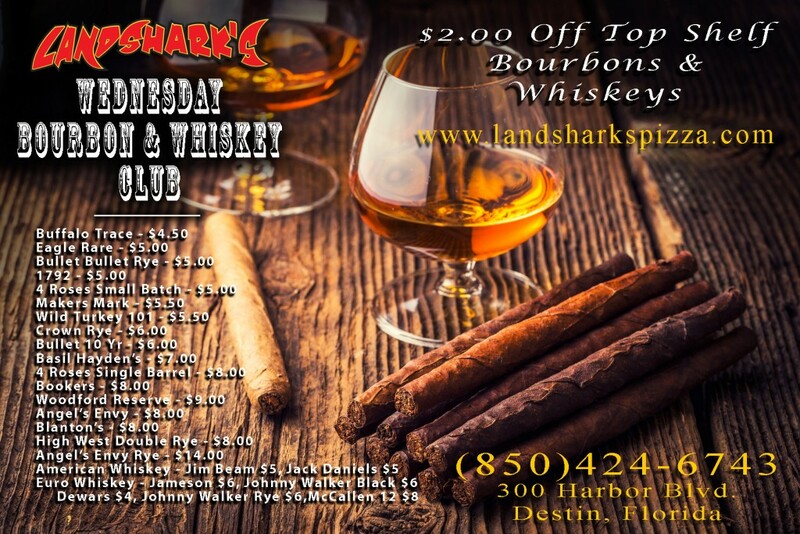 It could hit 70 today in Destin – THANK GOODNESS because we’re ready to live in FLORIDA again! Congratulations on having survived the arctic cold like a boss! 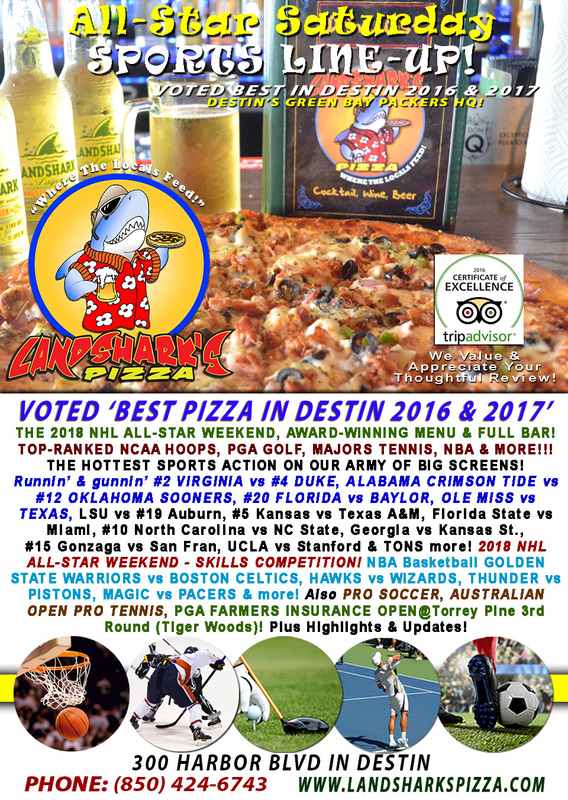 Come on in to cheer and chow down at Landshark’s with top-ranked College Hoops all day in Destin along with NHL, PGA, NBA and more! SPORTS ON OUR ARMY OF BIG SCREENS – 2018 NHL All-Star Weekend – Skills Competition! College Hoops #2 VIRGINIA vs #4 DUKE, ALABAMA vs #12 OKLAHOMA, #20 FLORIDA vs BAYLOR, OLE MISS vs TEXAS, LSU vs #19 Auburn, #5 Kansas vs Texas A&M, Florida State vs Miami, #10 North Carolina vs NC State, Georgia vs Kansas St., #15 Gonzaga vs San Fran, UCLA vs Stanford & TONS more! PGA 3rd Round FARMERS INSURANCE OPEN@Torrey Pines! 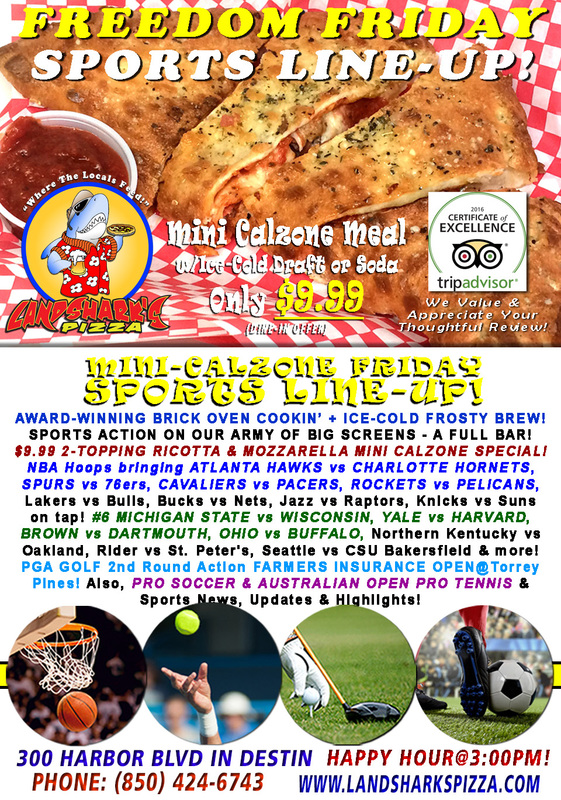 NBA Fastbreak GOLDEN STATE WARRIORS vs BOSTON CELTICS, HAWKS vs WIZARDS, THUNDER vs PISTONS, MAGIC vs PACERS & more! Also, PRO SOCCER & AUSTRALIAN OPEN PRO TENNIS coverage plus plenty of other Sports Broadcasts, Sporting News, Analysis, and Commentary! Pro Golf This Week: Farmers Insurance Open@Torrey Pines. 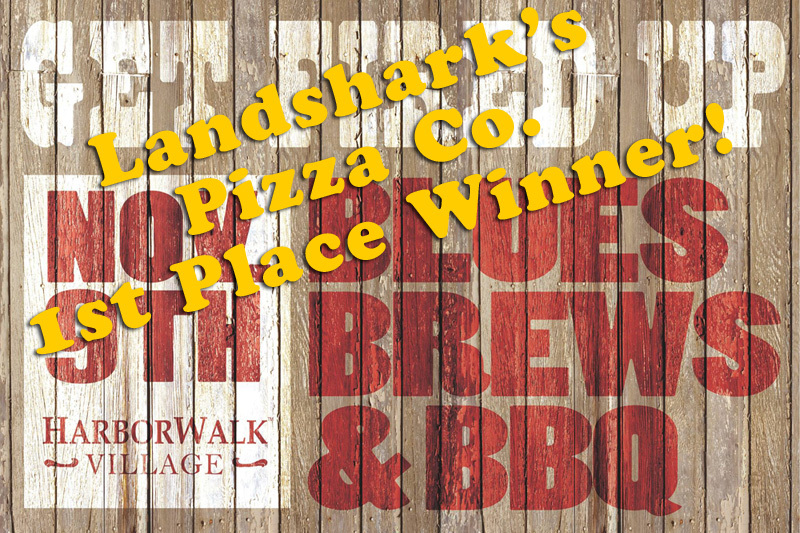 CALL LANDSHARK’S PIZZA IN DESTIN FOR YOUR CATERING NEEDS! 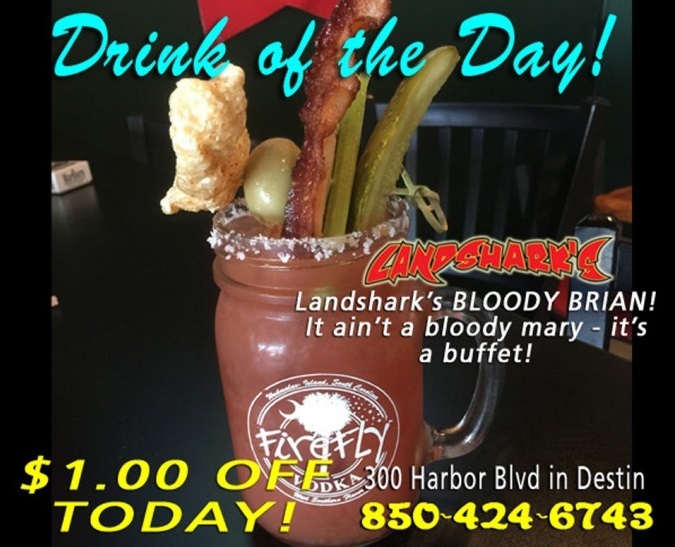 Previous Post: « T.G.I.FREEDOM FRIDAY at Landshark’s TWO-TOPPING CALZONE & Brew $9.99 NBA HAWKS, CAVS & ROCKETS!